This year, a lot of things have happened. We have received so much - from heartwarming comments to beautiful personalized cards to tiny packages in the the mail. We thank all of you for this. 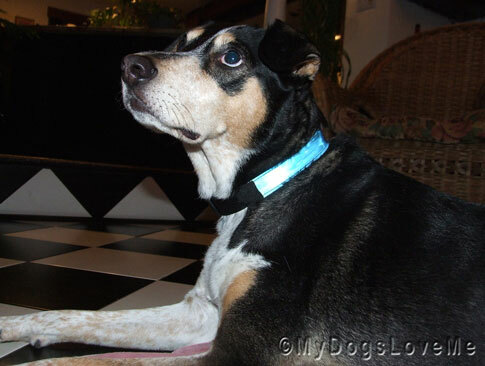 We recently won a very pretty LED collar from Lisa of DogsnPawz. Since it's only open for US residents, we decided to have it sent to Bella. Beauty is when you give something special to someone special and they look pretty wearing it. We would like to thank My Favorite Petshop for sponsoring Lisa's Giveaway that had us won the LED collar. Each buyer has a personal account where they can track the items' whereabouts. Their site also sends the tracking number for the shipment to update their customers of the purchased product's current status. 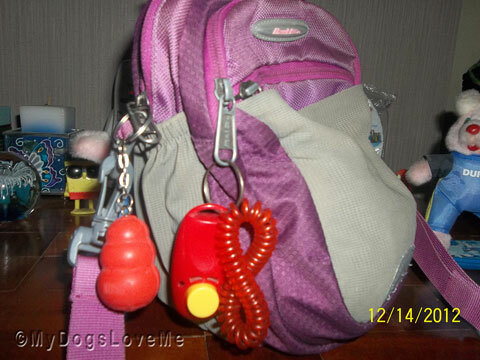 Flea from Dog Treat Web also sent us a Kong keychain which we got from the mail last week. It's now hanging safely beside my clicker keychain. Thanks, Flea. I promise to never call you using your old lady name! This blog hop is brought to you by Sugar. She's not only hosting this "This Moment See Beautiful" blog hop but for each one who joins the hop, Sugar will be donating $1 (up to $100!) to St. Anne's Center, The Lantern House : Pet Area! Yes it is very beautiful all the loving and caring freinds we have here in Blogville. Thanbk you for joining our Hop. Blogville friends are the best. Have a fabulous Friday. It has been so fun getting to know you and your gang this year, Have a great holiday. Sharing something nice with a good furriend is always beautiful! Christmas has come early for you! Aww, that was so kind of you. Bella looks great in her new collar! What a beautiful post! Blogville is such a sharing and caring place! I think bloggy friends are the best too,, and I love your collar. We couldn't agree more - our lives have become that much richer since joining the Blogville community! We want to thank you for the kind words of comfort in the loss of our Joey. That LED collar is gorgeous! And it will help on dark nights for sure! Bella looks great in that collar and Flea won the Angry Birds Dog Toys so she got them even though you didn't win them for her! I thought that was pretty cool! I also wanted to thank you for the Christmas card:) That was so very sweet of you and I was so excited to get it! I have never received anything from the Philippines. How cool is that! Thanks for being our blogging buddy. We think you are awesome! That was wonderful for you to send the collar to your friend Bella! We send your our purrs and good thoughts of health for you all to be feeling better ASAP! May you have a wonderful Christmas and may 2013 bring your family health, joy, prosperity and many other blessings. We did receive your card and say, "Thank You!" This time of year, especially with the card exchange, we are so grateful for all our friends. Wow, look at all that cool stuff! Hey, your person has a clicker? Mine does too! I love it when my clicker comes out because it means we get to play pawesome games where I guess what my person wants and she gives me food when I get it right. I LOVE this!! Hey, do you know any cool tricks? We got your post card today! My person says it came a very long way, and she was very excited. Thanks so much for sending it - it has so many cute Dog faces on the front! Oh, and we love your background too with the sleeping Dogs. We're going to follow you now. But not around the house, just in blogspace. We can't wait to hear more of your adventures!